Do not travel in the opposite direction of a pilot car and vehicles following it. Some construction projects will use a signed vehicle — known as a pilot car — to lead traffic through a single-lane work zone at a safe speed. A pilot car is identified by a "PILOT CAR FOLLOW ME" sign on the rear of the vehicle. Only one lane of traffic is open. 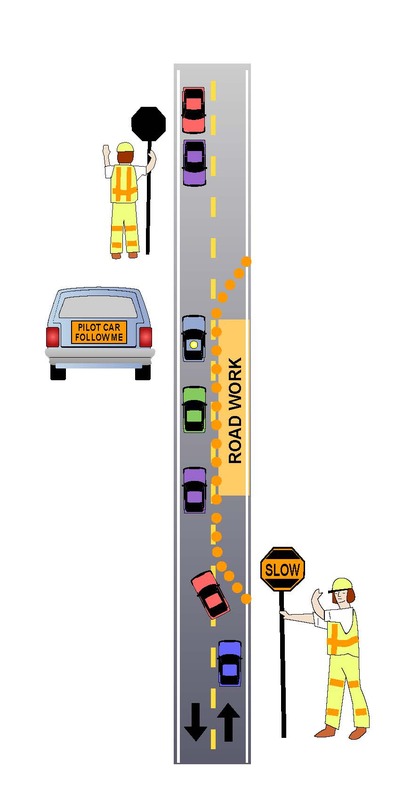 A flagger will release traffic to follow a pilot car to the other end of the work zone, where a second flagger prevents traffic in the opposing lane from entering. Only traffic following a pilot car in the same direction is released. If you are entering a single-lane work zone that uses a pilot car, wait for this car and any following vehicles to pass you. Then you must travel in the same direction. Do not travel in the opposite direction of a pilot car or any following vehicles.